Tomica #55 Toyota Crown Taxi cab, 1:65 Die cast Japan made, Yellow Red Int Mint! Vintage Tomica F56 Austin London Taxi Cab Promo St Martins White Red Int Mint! Tomy Tomica #22 Toyota Crown Taxi cab 1:62 Die cast, Green, Black Int Mint! Tomica #13 Nissan Cedric 280 E Taxi cab, 1:65 Die cast Japan made Rare & Mint! Tomica #13 Nissan CedrIc H.T. 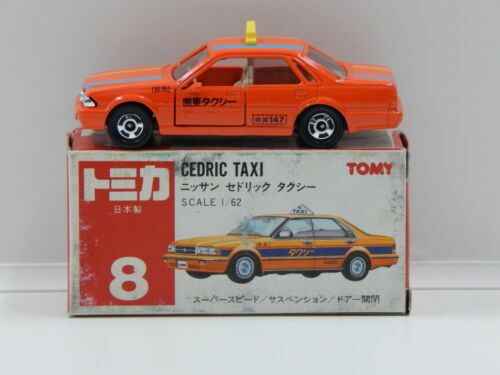 Taxi cab 1:62 Die cast, Japan made, Orange Mint! Tomica #13 Nissan CedrIc H.T. Taxi cab 1:62 Die cast, Yellow Black Int Mint! Tomica 1 Nissan New Bluebird SSS C Taxi Cab Japan Made Yellow Red interior Mint! TOMICA / #27 - Nissan NV200 New York City Taxi / Mint in box. 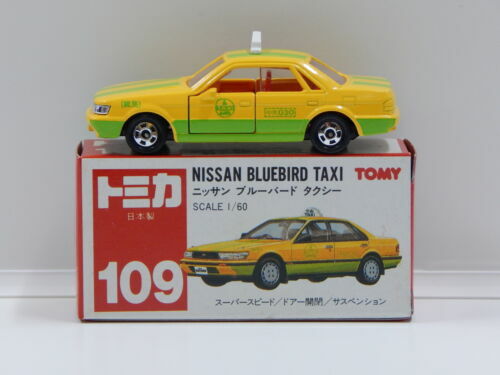 TOMICA DANDY NISSAN GLORIA TAXI 1/43 COMME NEUF sans boite, voir photos.